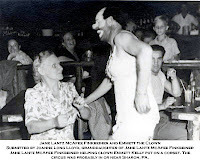 Pat Cashin's CLOWNALLEY: BOZO HARRELL: Mystery Solved! I'm almost one hundred percent sure that the Clown in the above photo, who looks like Emmett, is this guy, Bozo Harrell. He was a burlesque comic and he was doing some circus clowning in the '40s and '50s..."
I would have to agree. The resemblance is uncanny. Bozo Harrell looks like he might be the tramp clown that I've seen working with Olsen & Johnson on a lot of their early television dates. Among other bits, he performed a very quick midget car gag that combined elements of Lou Jacobs, Kinko Sunberry and Bobo Barnett's routines on an episode of the Steve Allen show that I saw at the Museum of Television and Radio (now called "The Paley Center for Media") in New York. If he had a background as a burlesque comic, I'd bet dollars to donuts that it's got to be the same guy. Anyone else out there have any info on Mr. Harrell? I'll go along with that, Trudy & I both racked our brains over it, we both knew the face but coulcn't come up with the name. I had forgotten about Bozo. He also did an act balancing very heavy objects on his chin, like an old wagon wheel, and was not a prop made to look heavy, it must have been 100lbs+. That also seems like a 100 yrs. ago, well at least 50!!!! My name is Phyllis Harrell Brush. Ralph "BOZO" Harrell was my uncle. 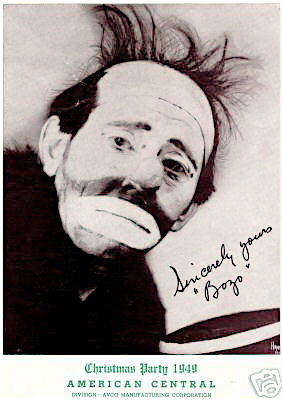 He became BOZO in 1914. He traveled with many circus's. He was with Roy Rogers in the 40's. He performed with many Shrine Circus,Cole Bros.Siebrand Bros. Piccadill Circus Headed clown Alley, Hagan-Wallace Circus 1930's. Barnes & Curruthes, Rench Wright, Ernie Young, Tom Packs, Clyde Beaty Circus, 101 Ranch, Royal American Shows in the 50's and many many more over the years. He also did the burlesque & Juggling act for Moose Lodges and clubs. He was a wounderful and funney man. Hello. I know this is an old post. My name is Brian, and "bozo" is my step-great grandfather. That is indeed who is pictured here. He married my great grandmother after her first husband, my grandmothers father, died. I only knwe him briefly. My sister has an entire room in her house dedicated to my familys circuis heritage. I got a chill when i saw the pics. Thanks. ROGER "RUMPY" PRYSTANSKI: Happy Birthday!